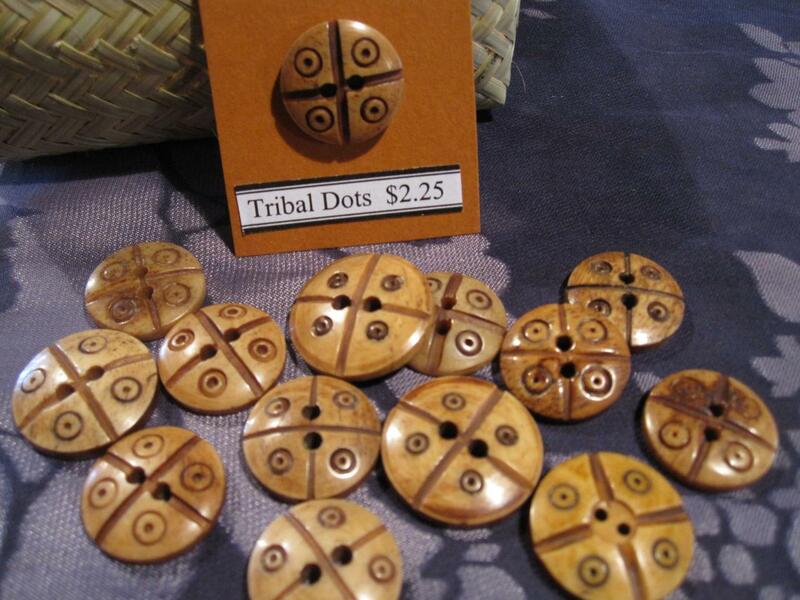 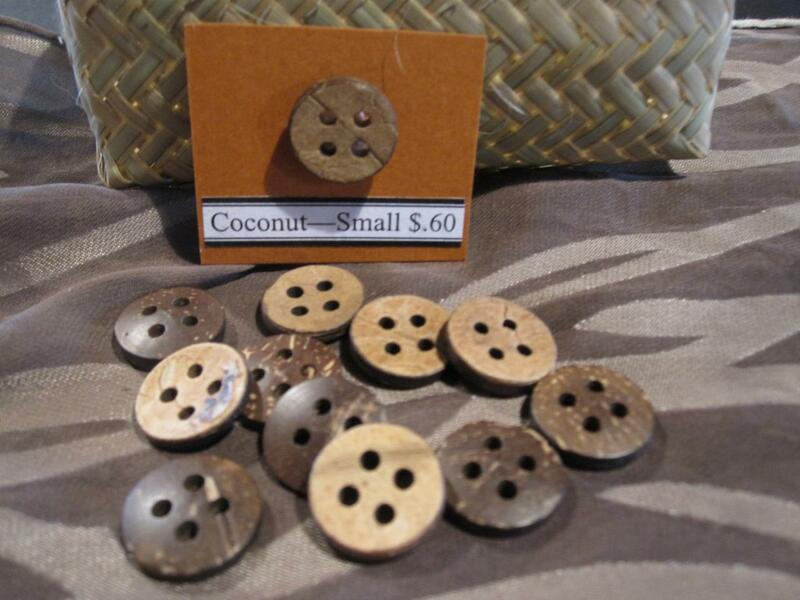 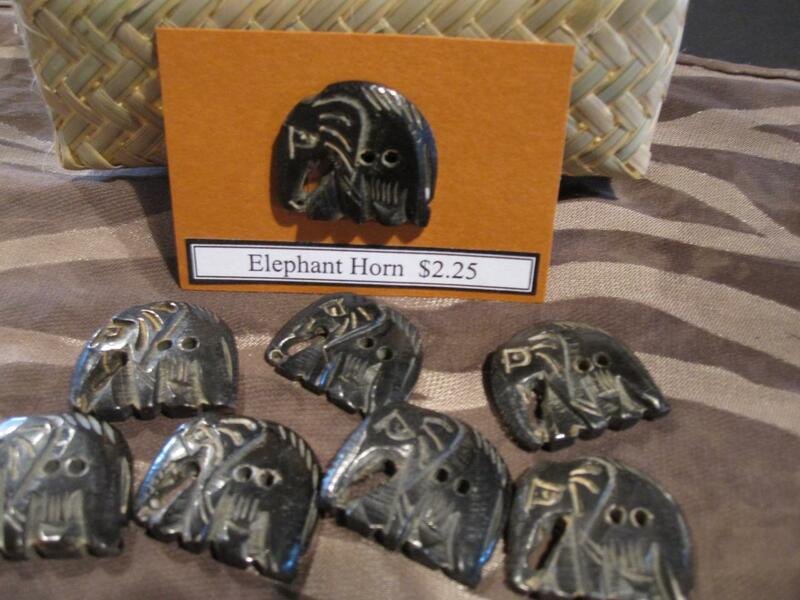 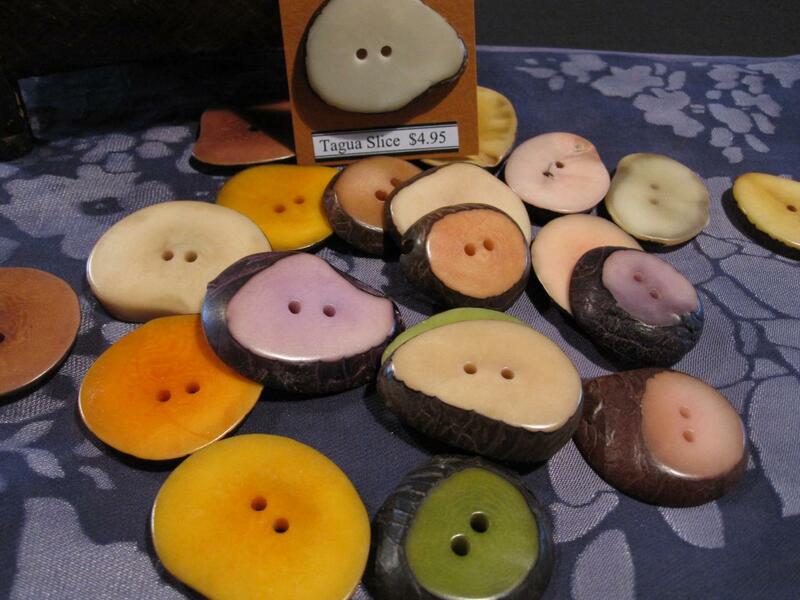 At Earthues we provide a large collection of hand made buttons from around the world. 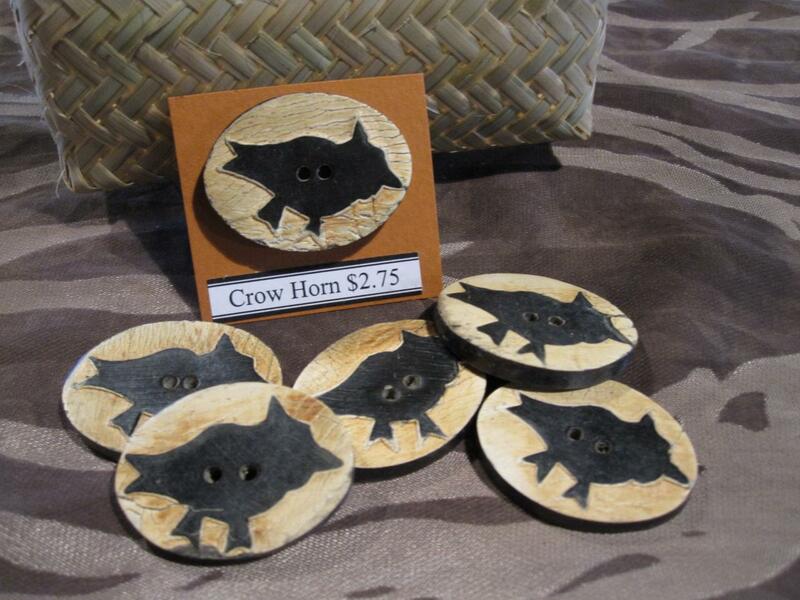 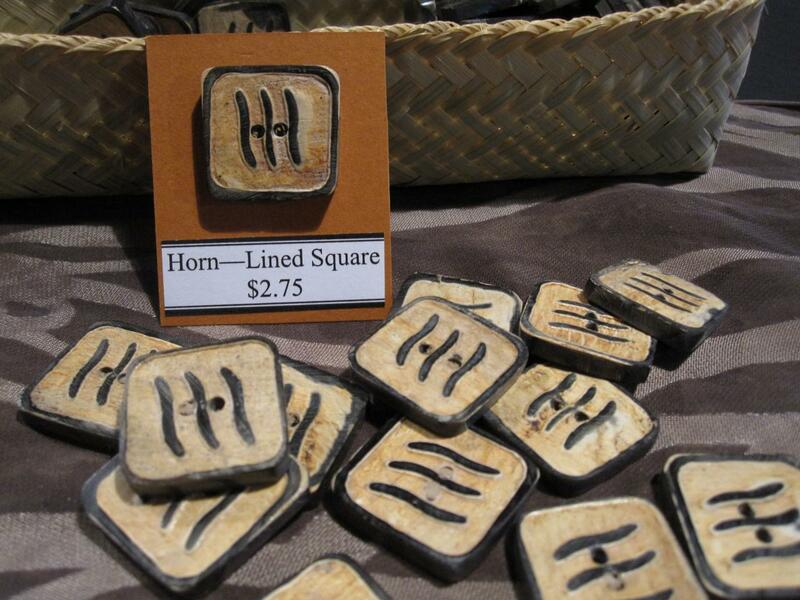 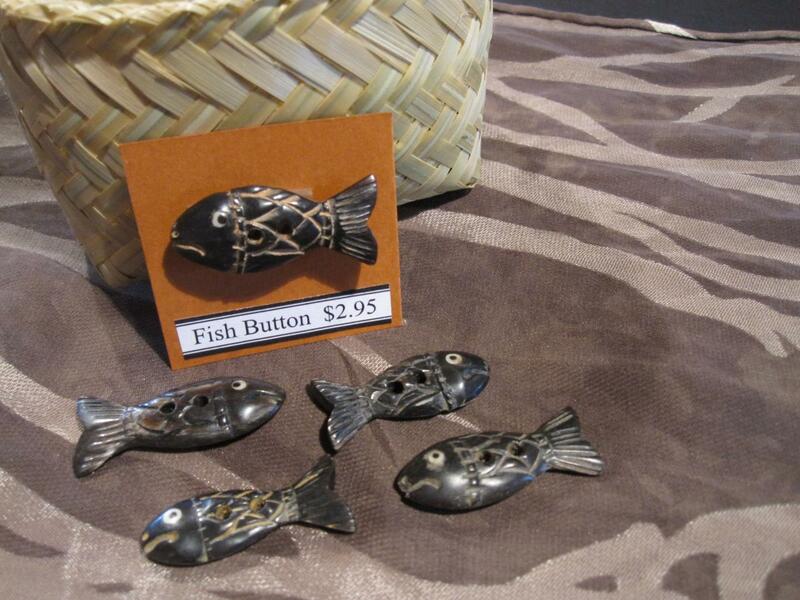 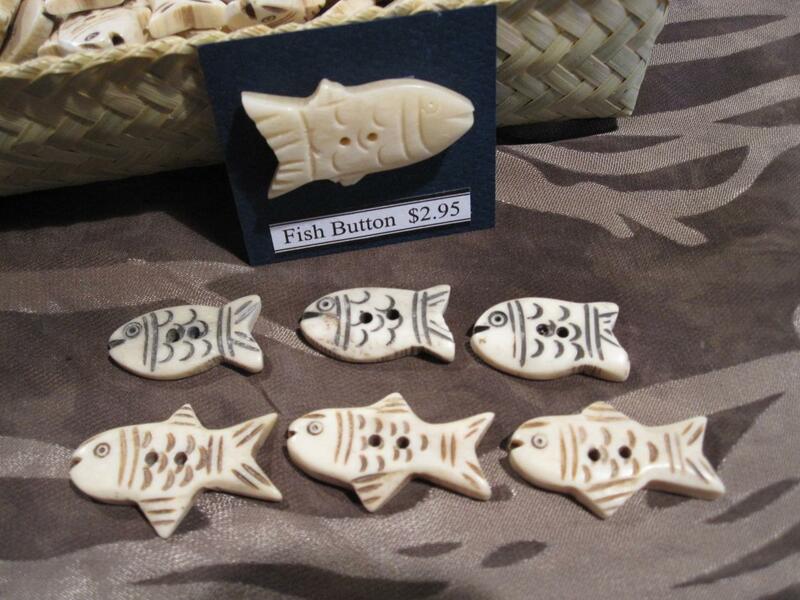 Each is hand-carved and made out of a sustainable, natural material. 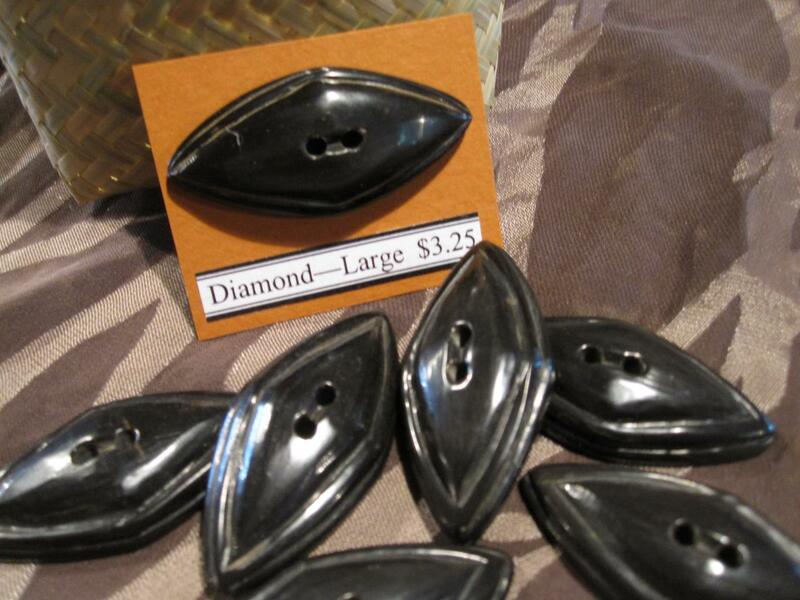 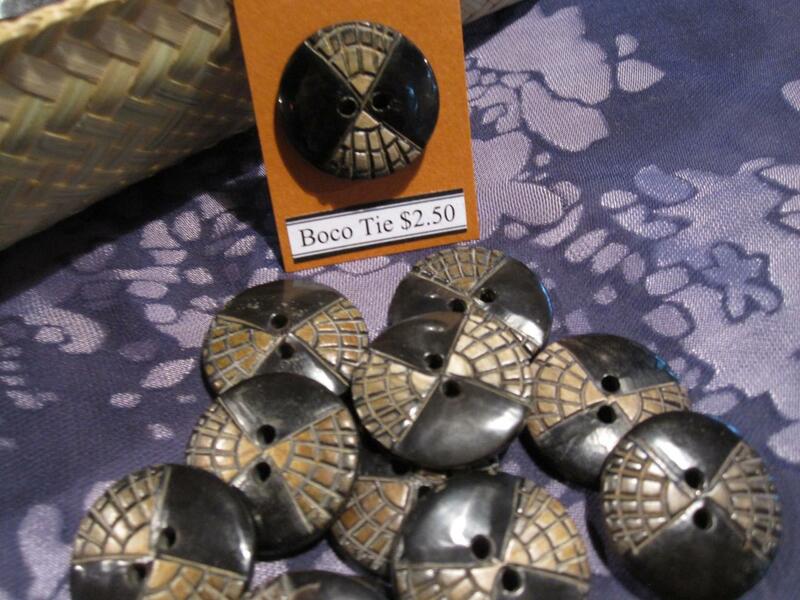 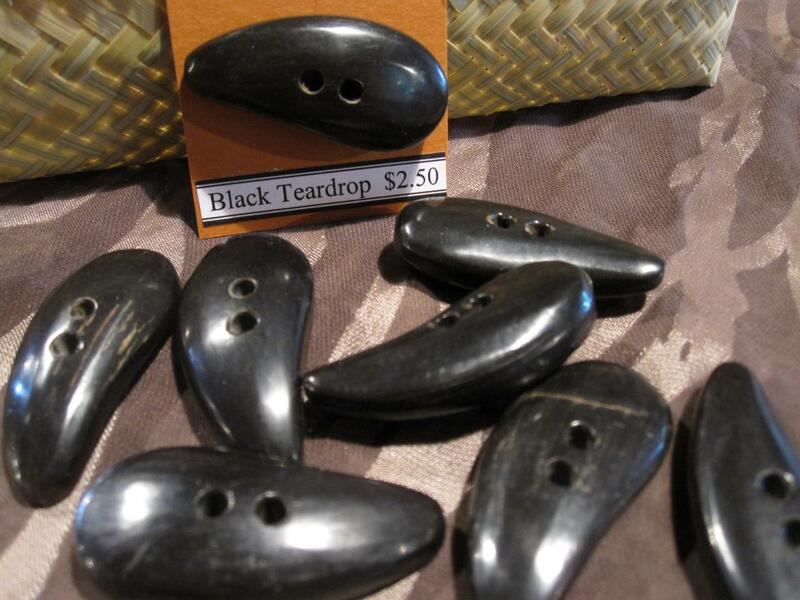 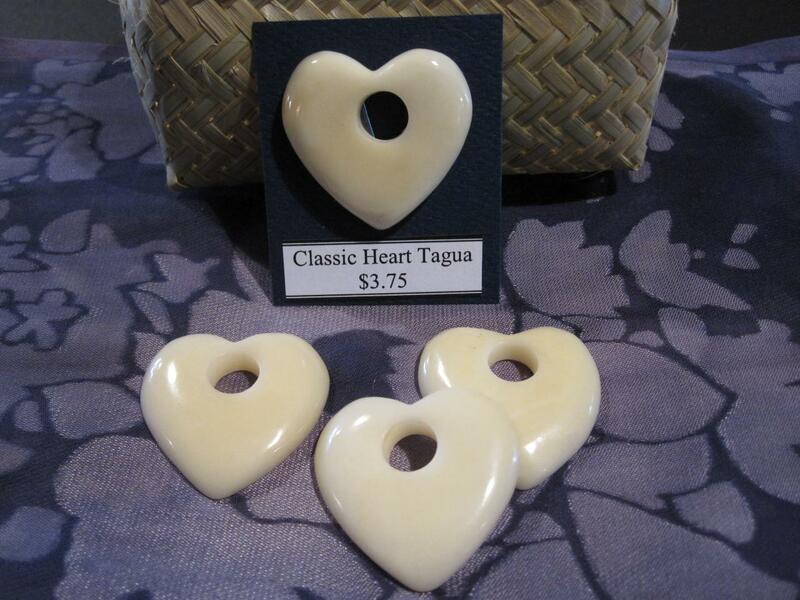 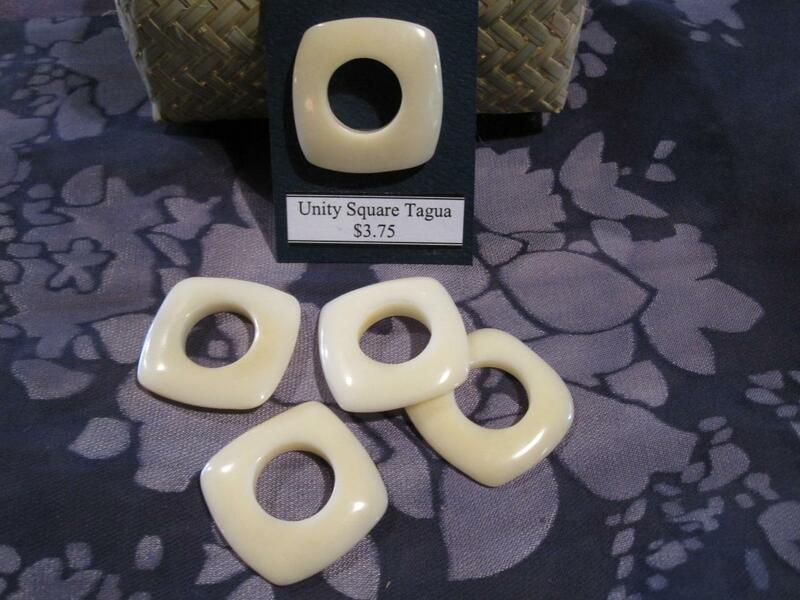 Tagua: Also known as vegetable ivory, this nut grows three-to-a-pod and is surrounded by a smooth brown husk. 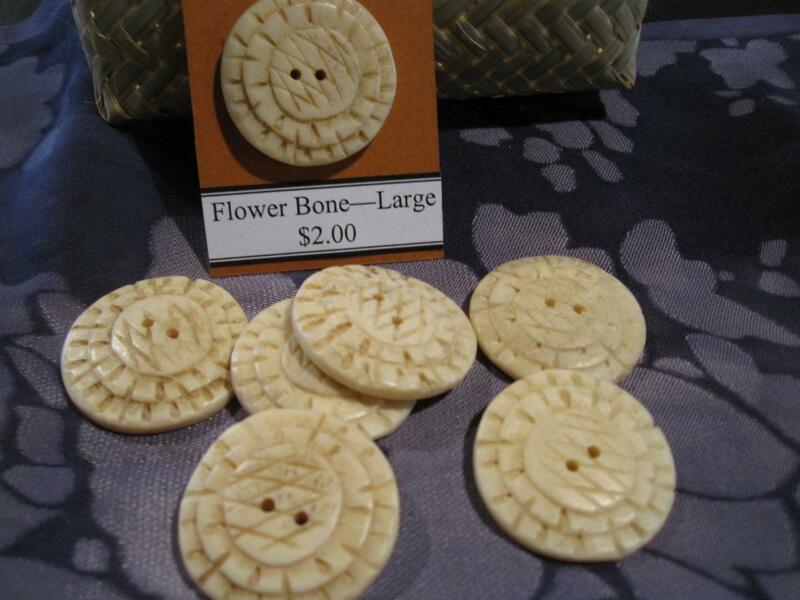 The meat of the nut is very hard and is a beautiful cream color. 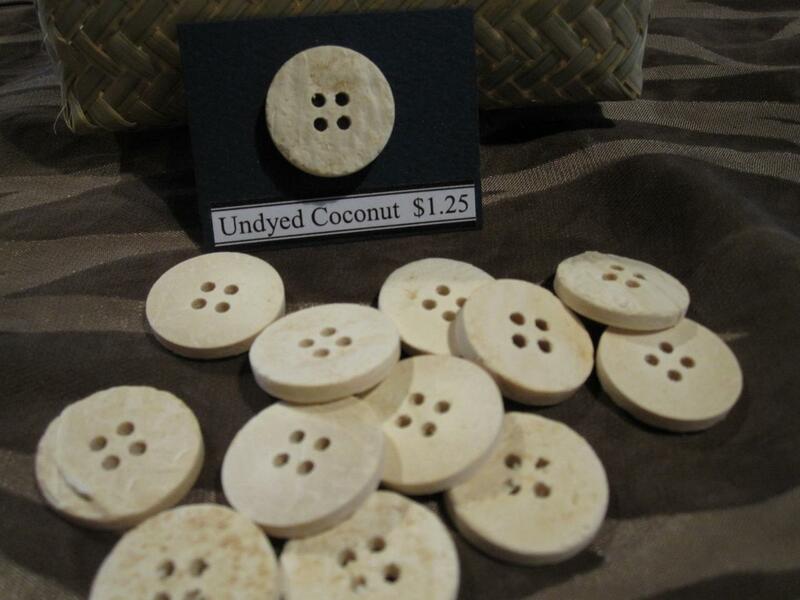 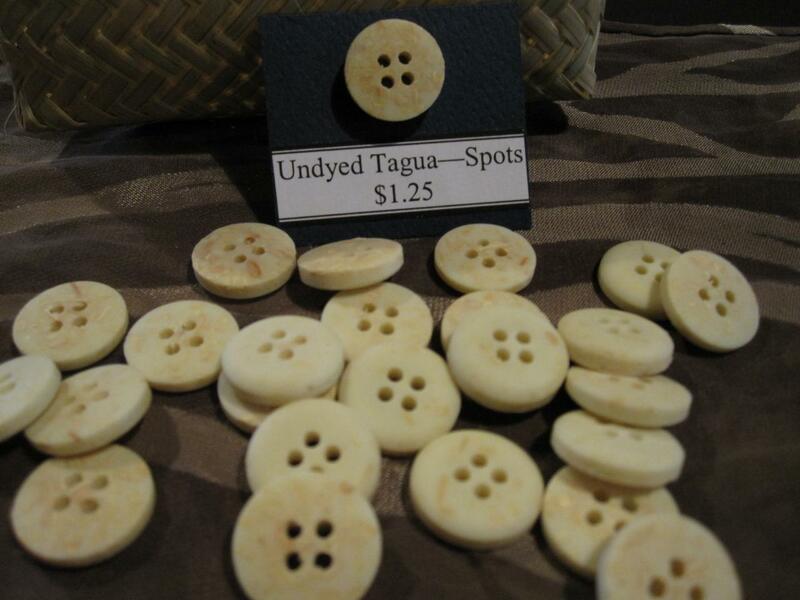 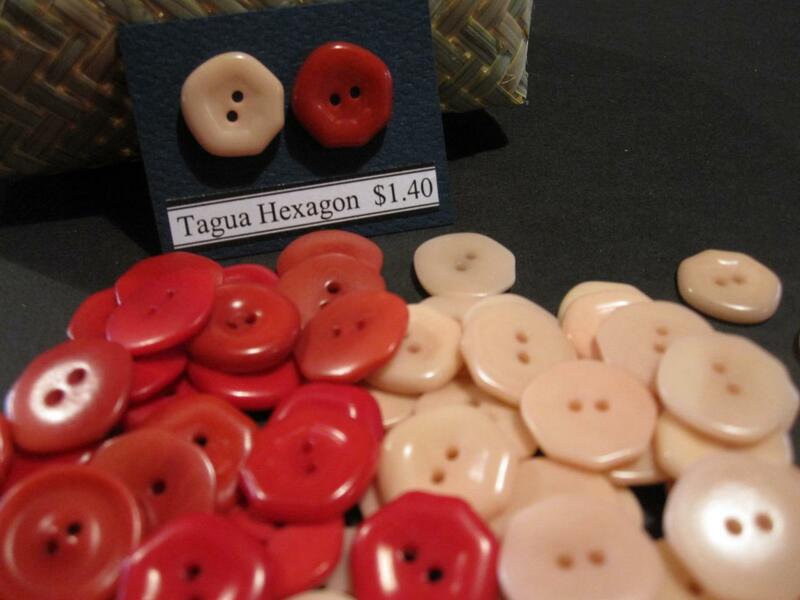 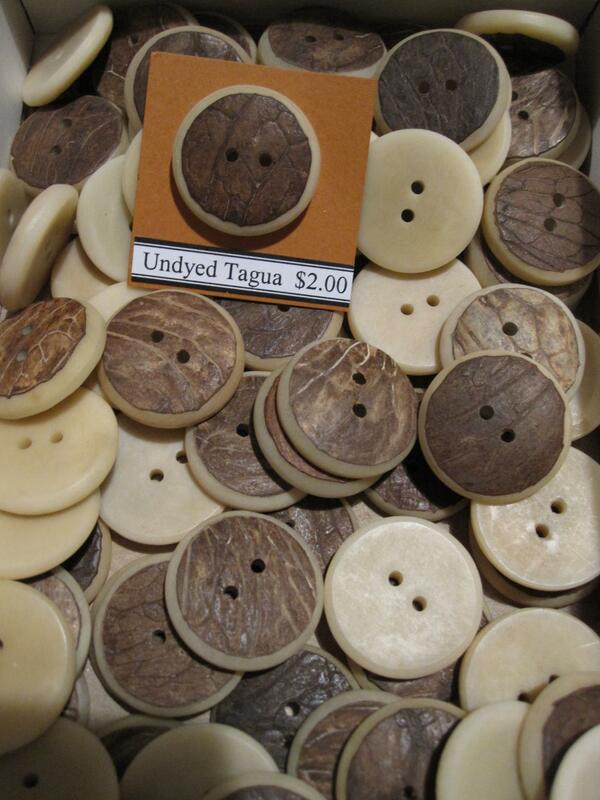 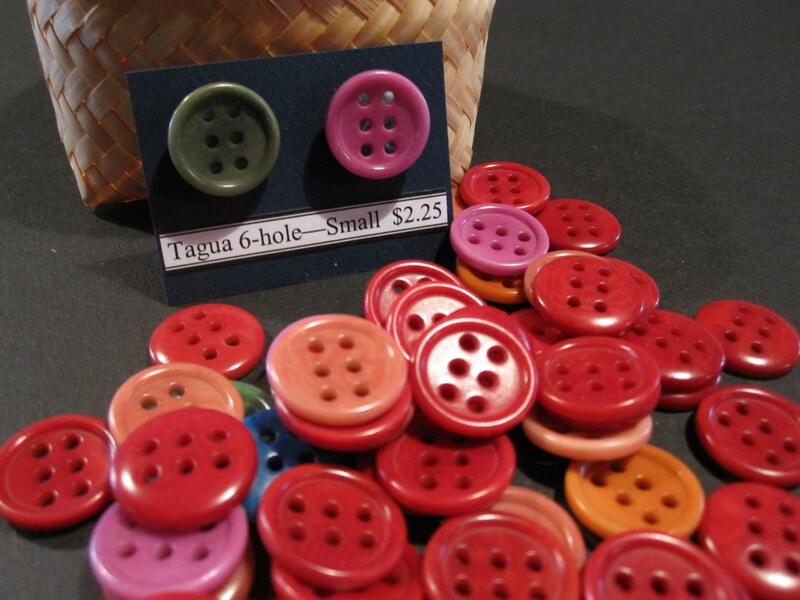 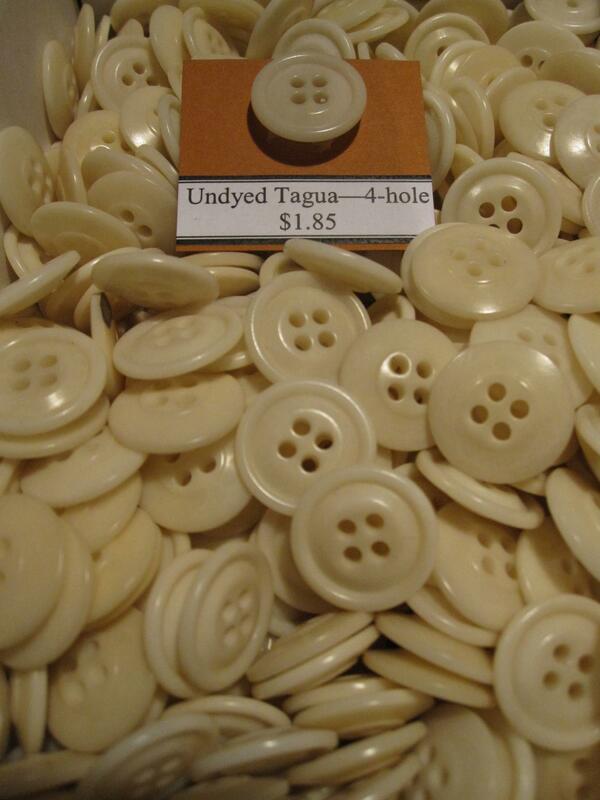 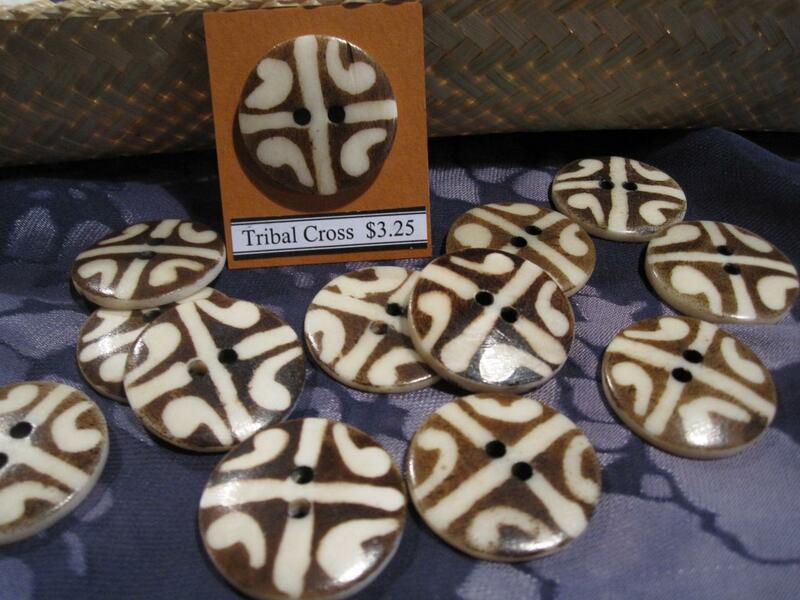 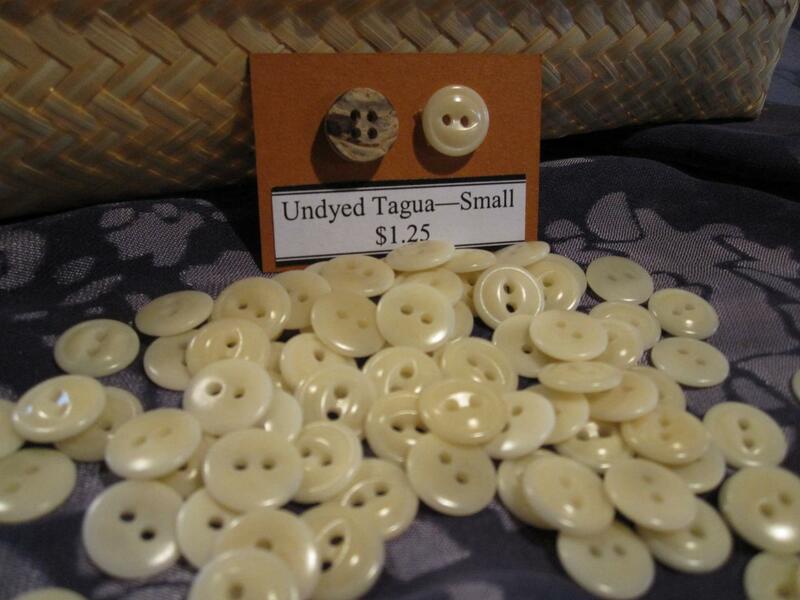 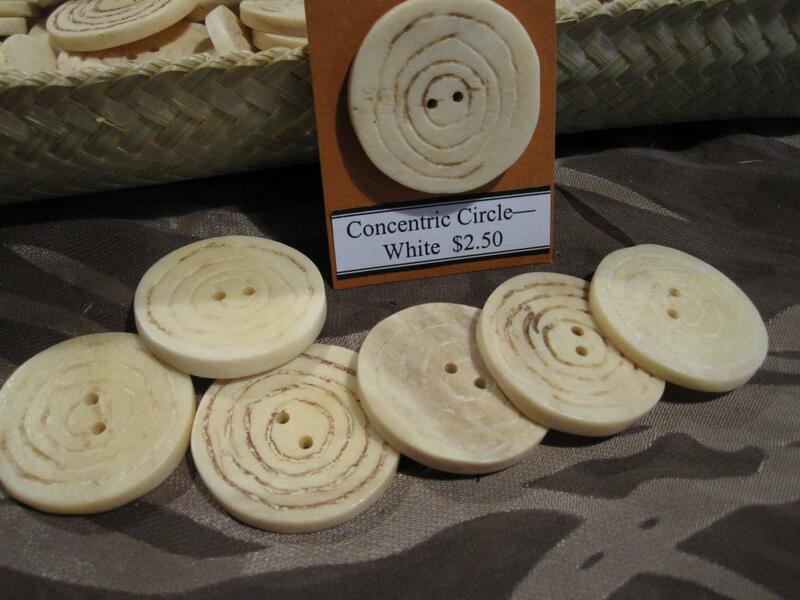 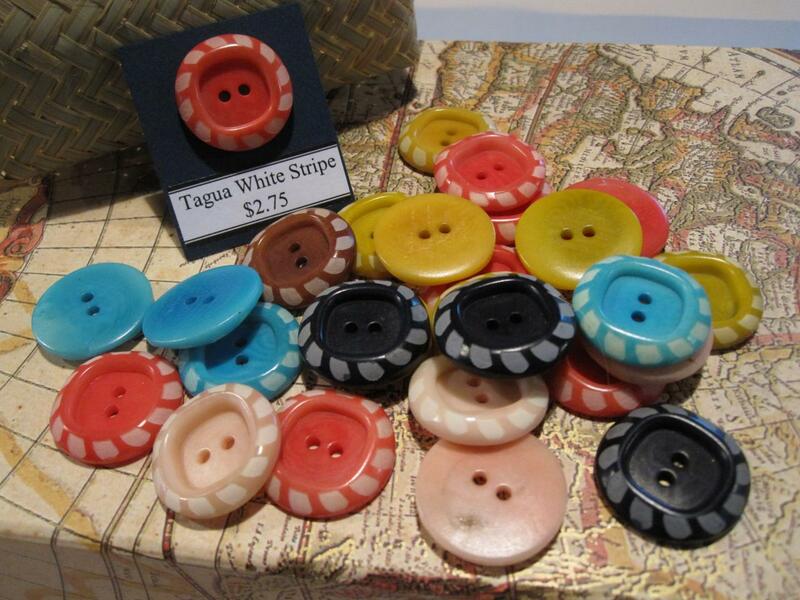 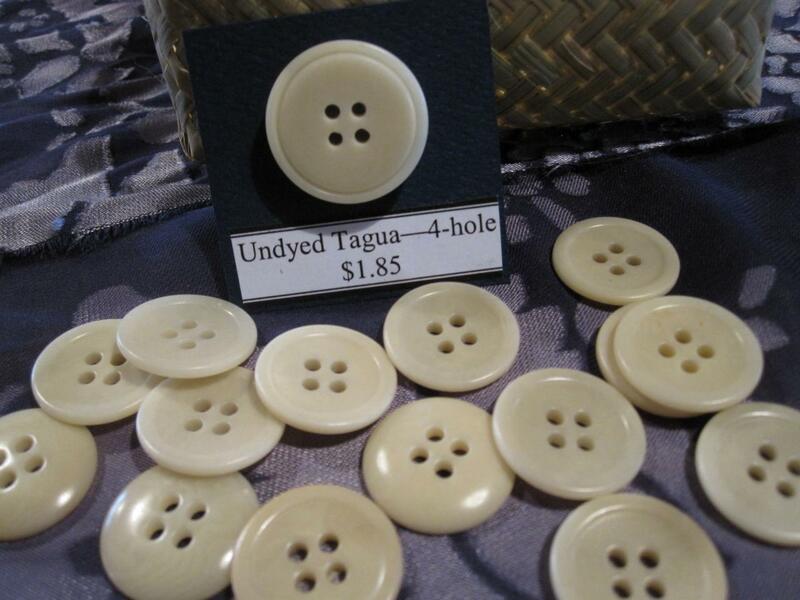 Buttons made from tagua take dyes beautifully, and in addition to our undyed tagua button selection we have a variety of naturally dyed tagua buttons to choose from. 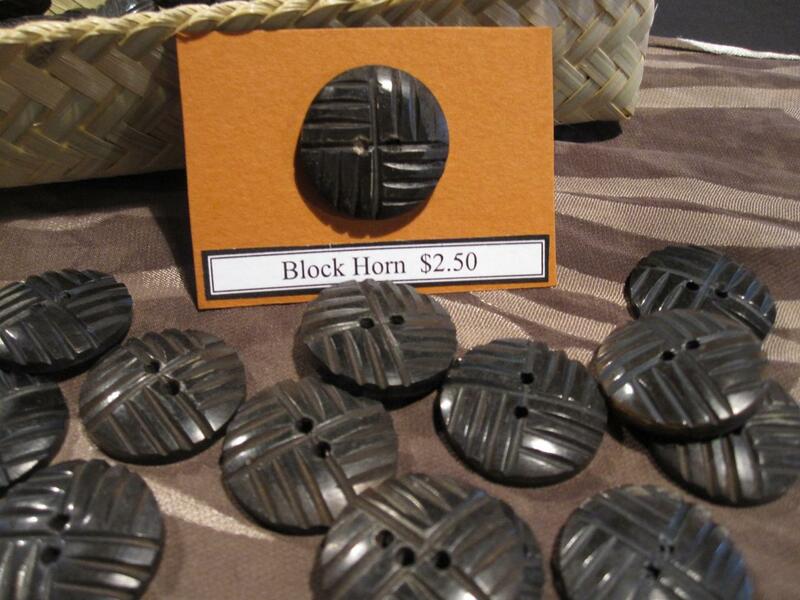 Horn: The horn of water buffalo is usually wasted when the rest of the animal is processed for food. 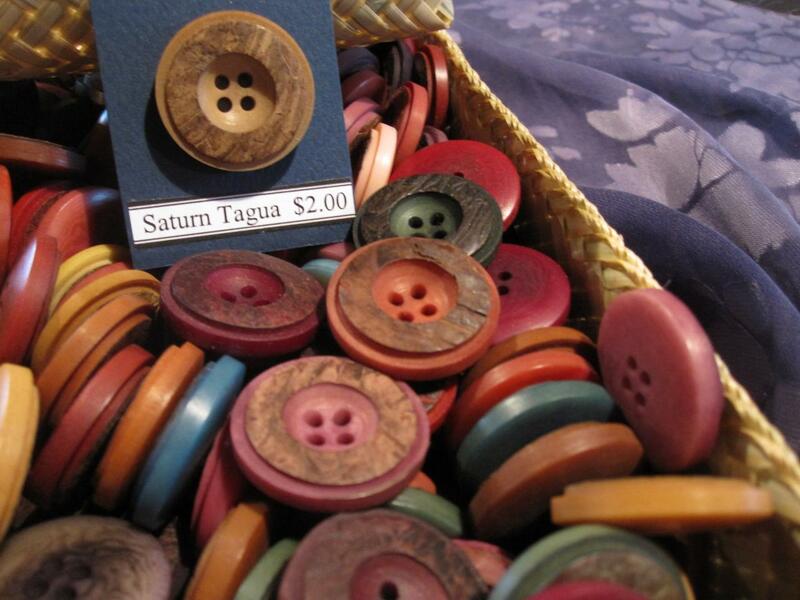 Utilizing this resource to make buttons is a great way to make beautiful buttons from a sustainable source while reducing waste. 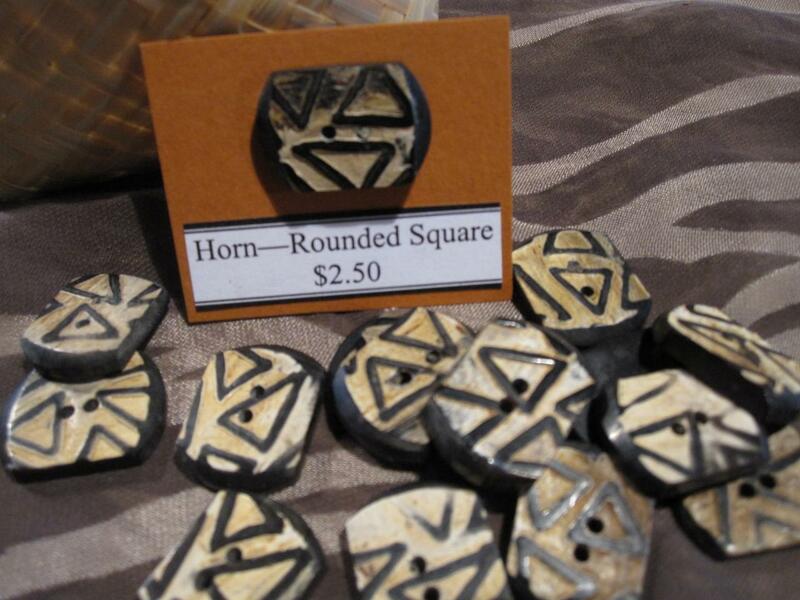 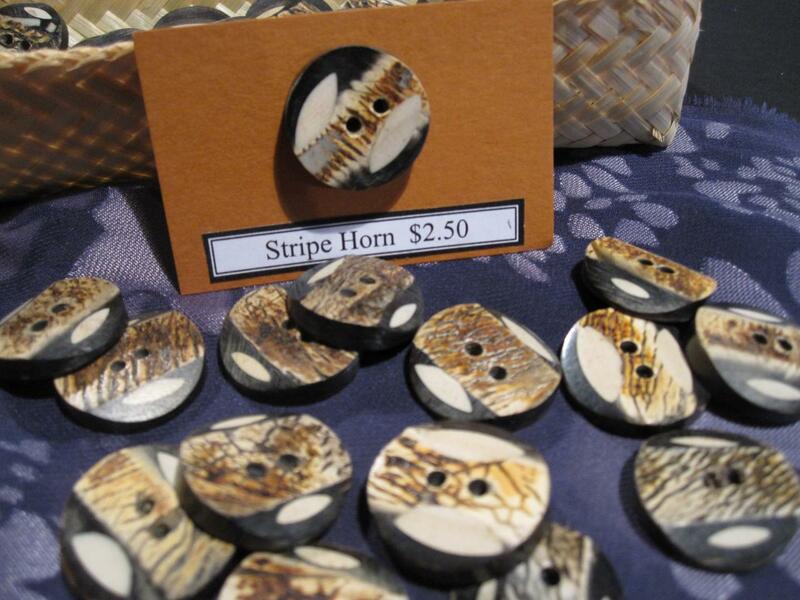 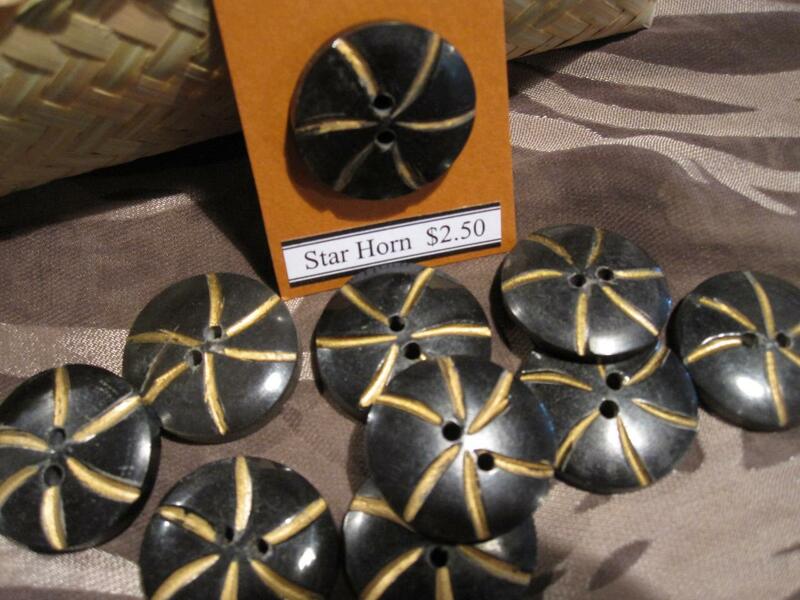 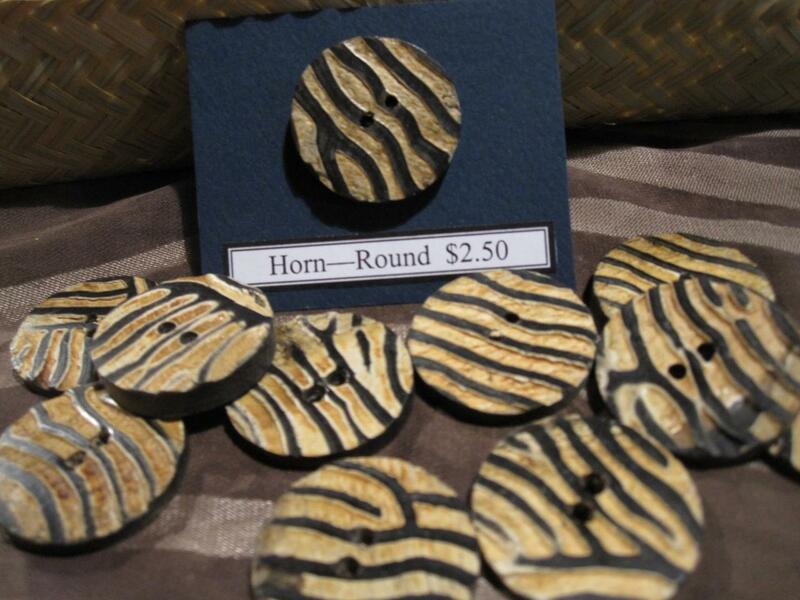 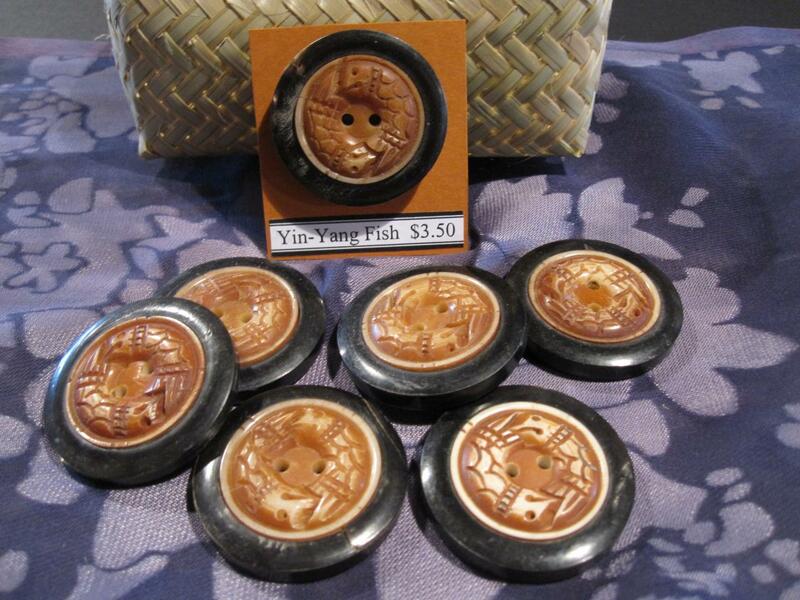 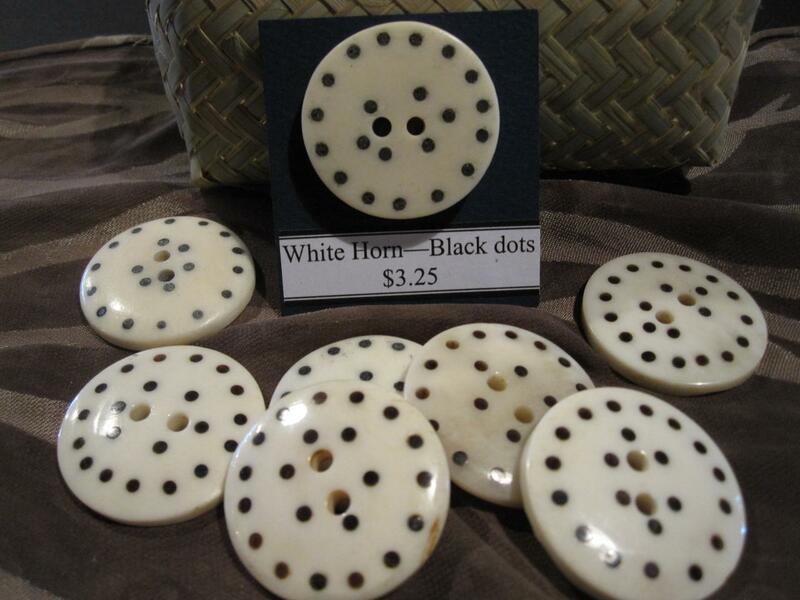 The color of horn varies from black to brown to white, and the color variation is often used in the carving to make multicolored carved buttons. 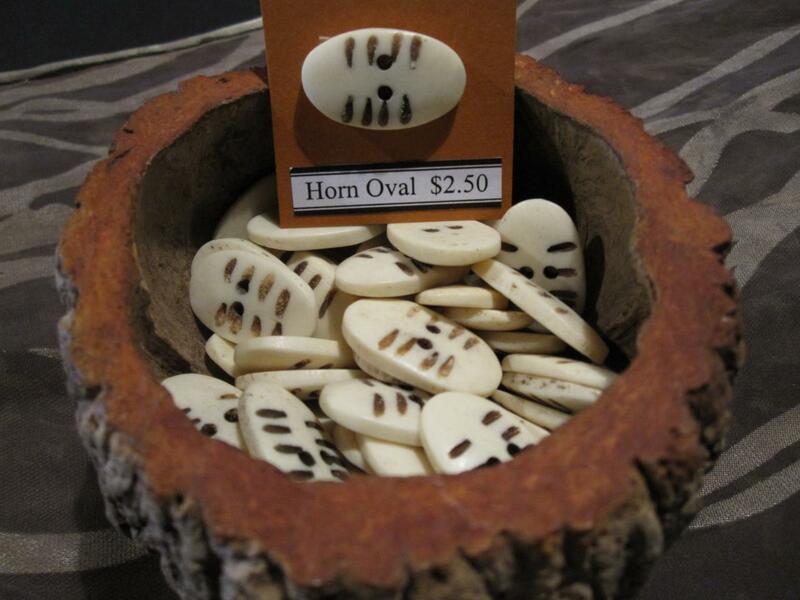 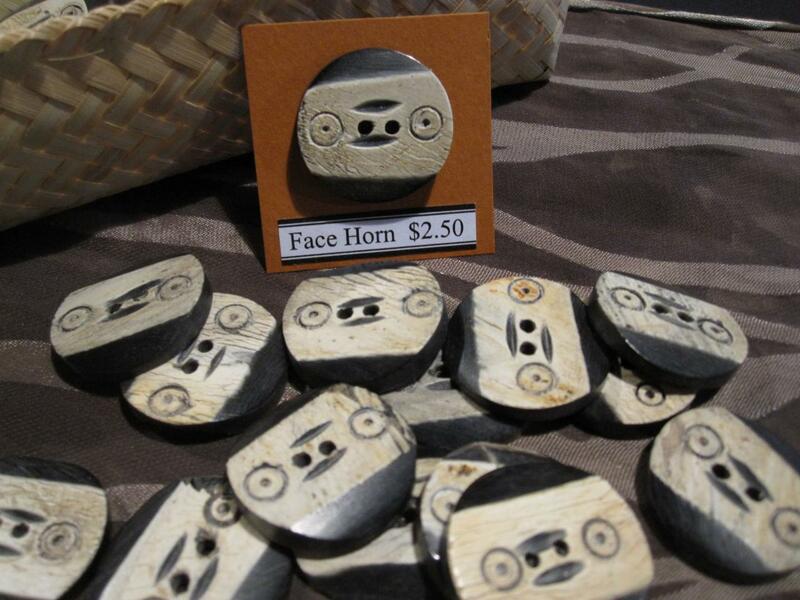 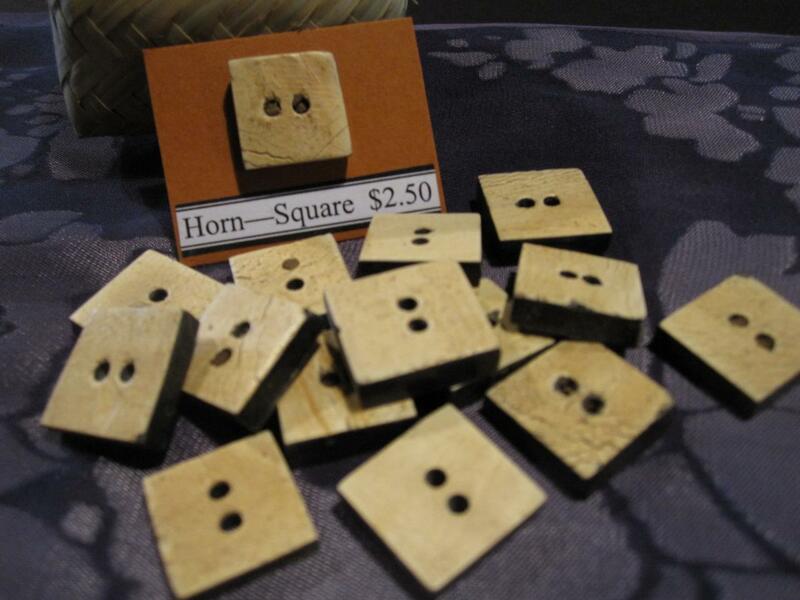 Bone: Like buffalo horn, bones are often looked upon as a waste product. 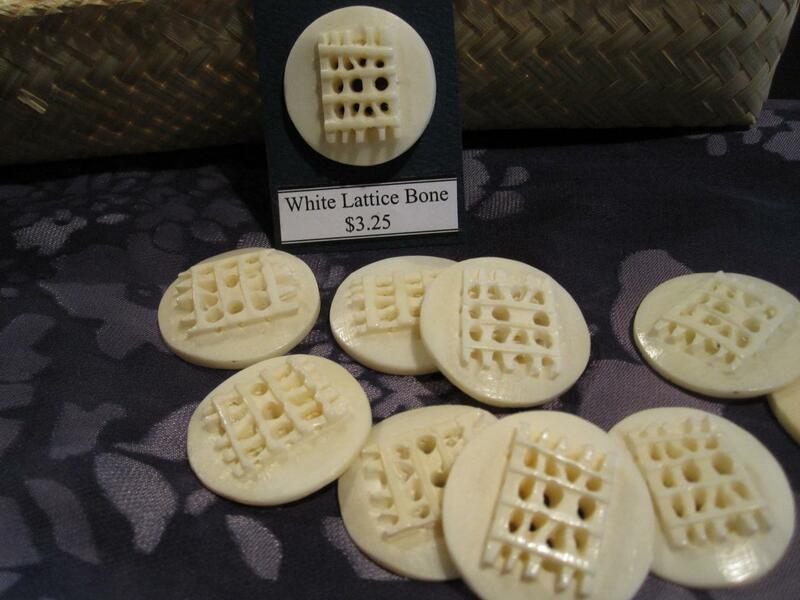 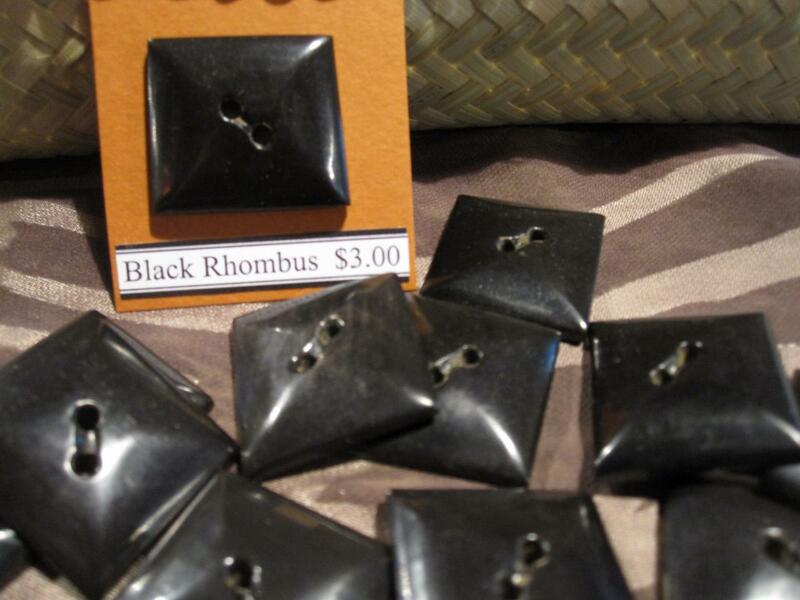 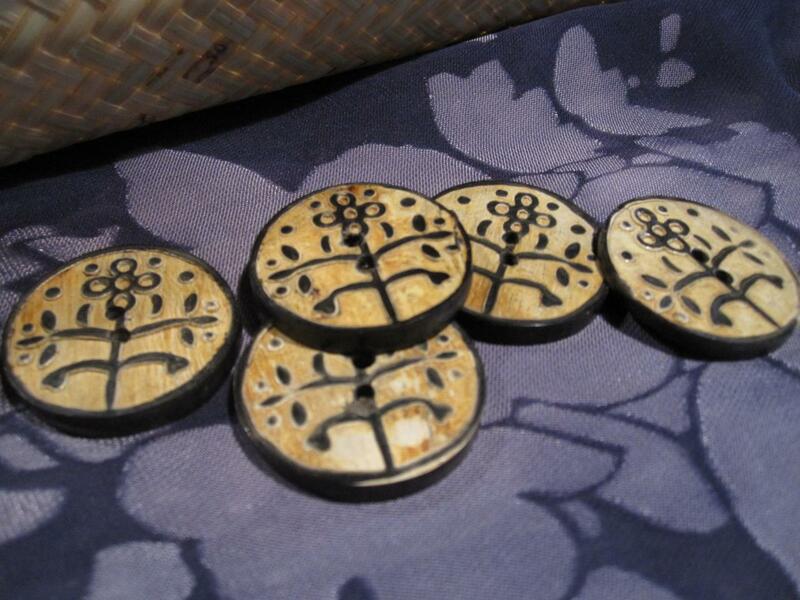 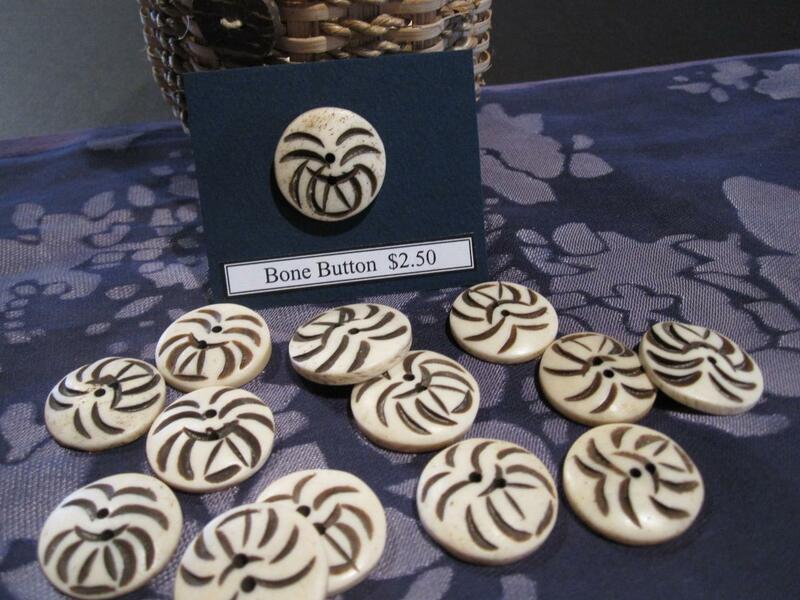 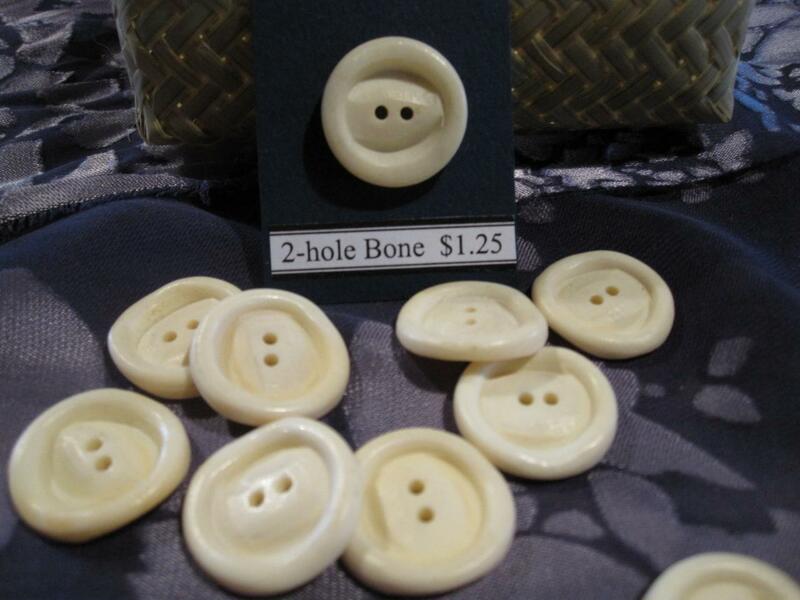 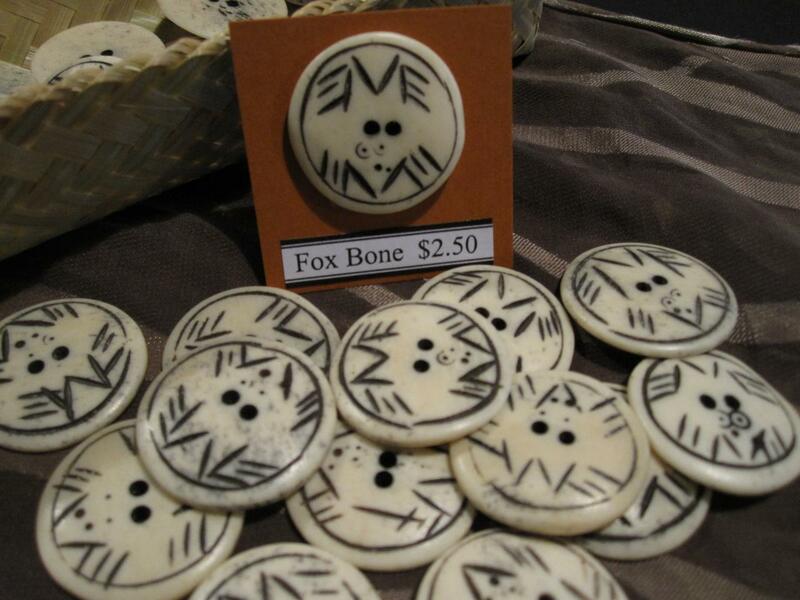 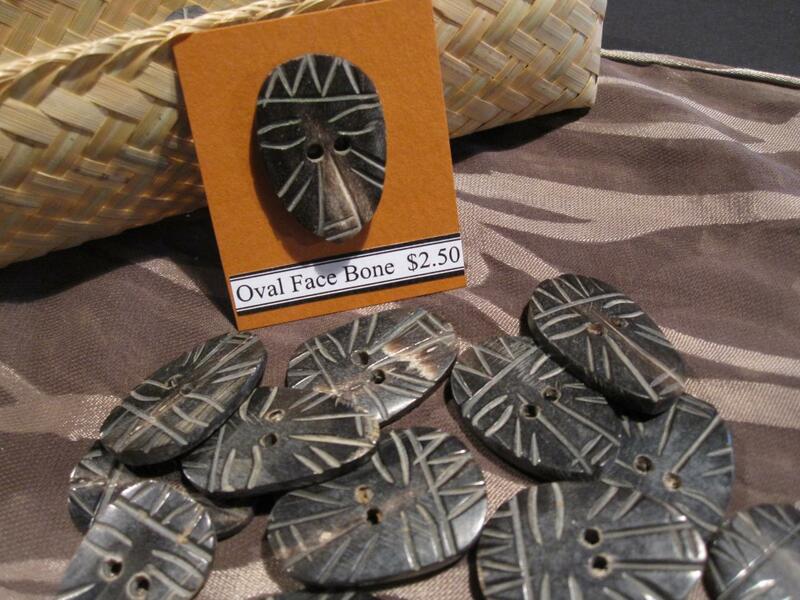 The unwanted bones are carved into unique and striking buttons, turning refuse into an income sufficient for supporting a community. 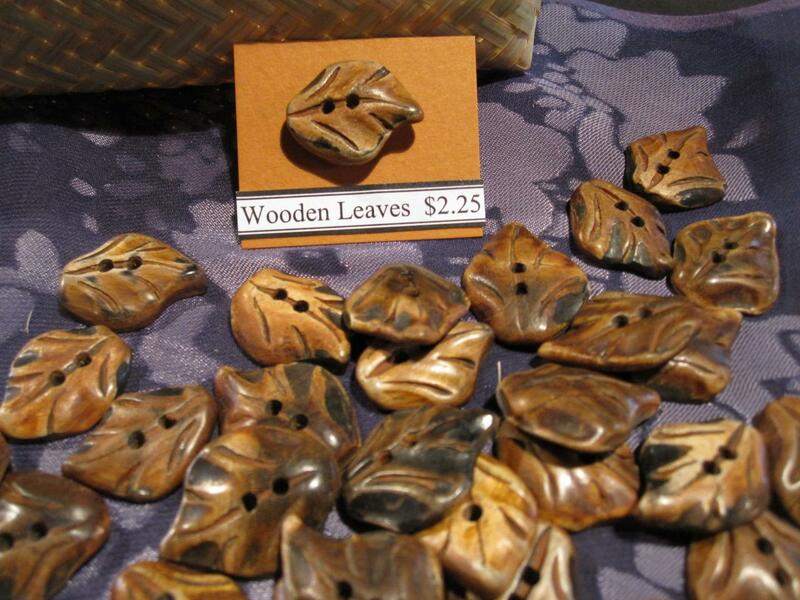 Wood: This material is used throughout the world for innumerable tasks and purposes. 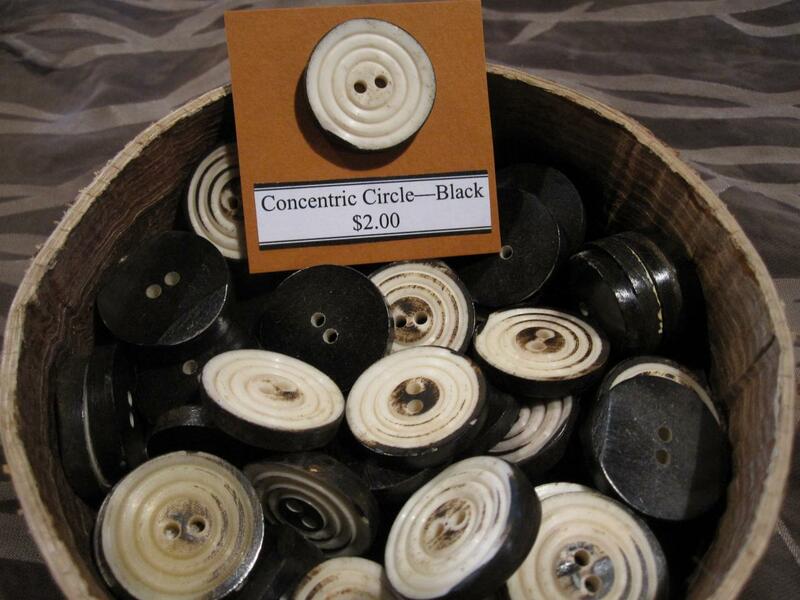 Processes that create wooden products, even lumber, often leave behind many scraps. 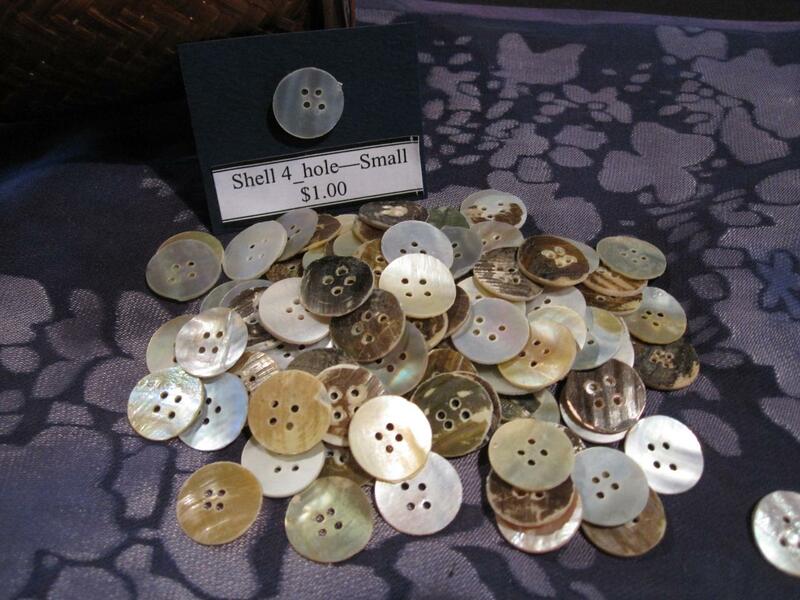 These are too small to be used for many other purposes, but this waste can be prevented by carving the scraps into buttons. 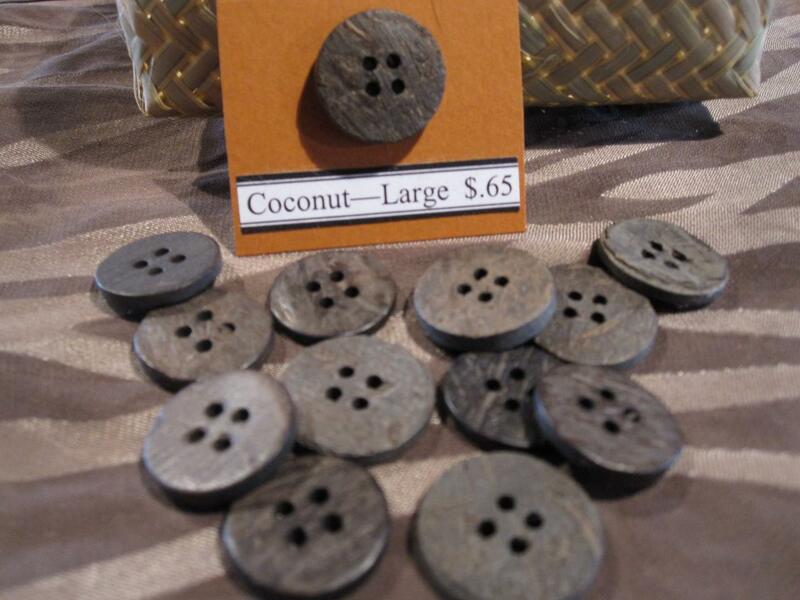 Coconut Shell: The nut from the abundant and fast growing coconut palm is a well loved food in much of the world. 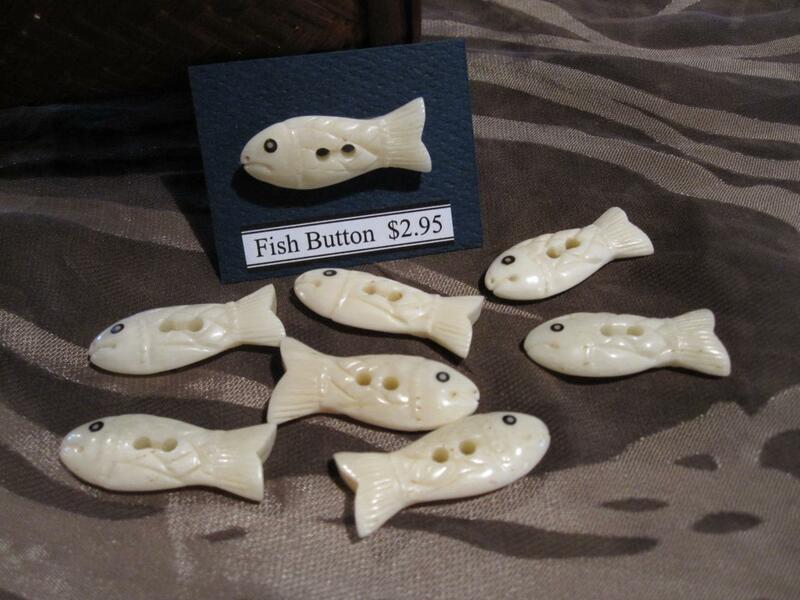 The inside is eaten and the shell often goes to waste. 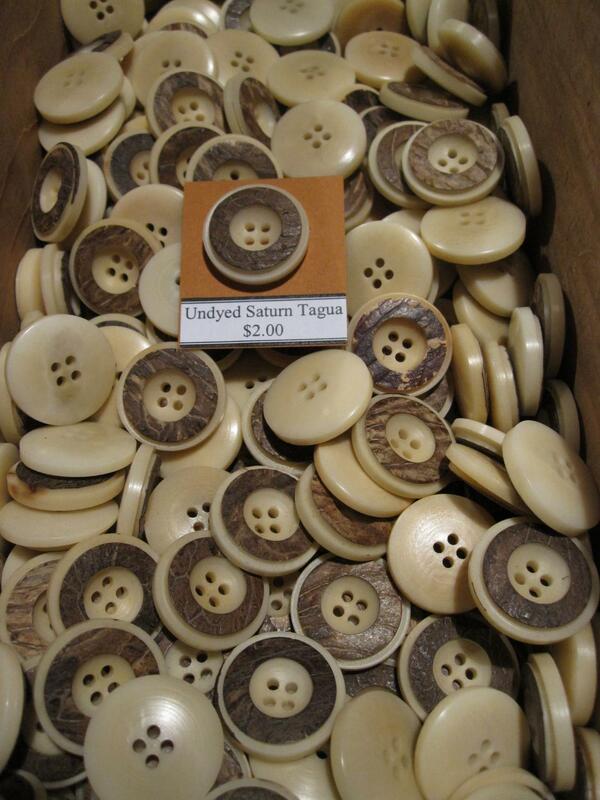 By using this unwanted material to make buttons, waste is reduced and communities are supported by a sustainable resource. 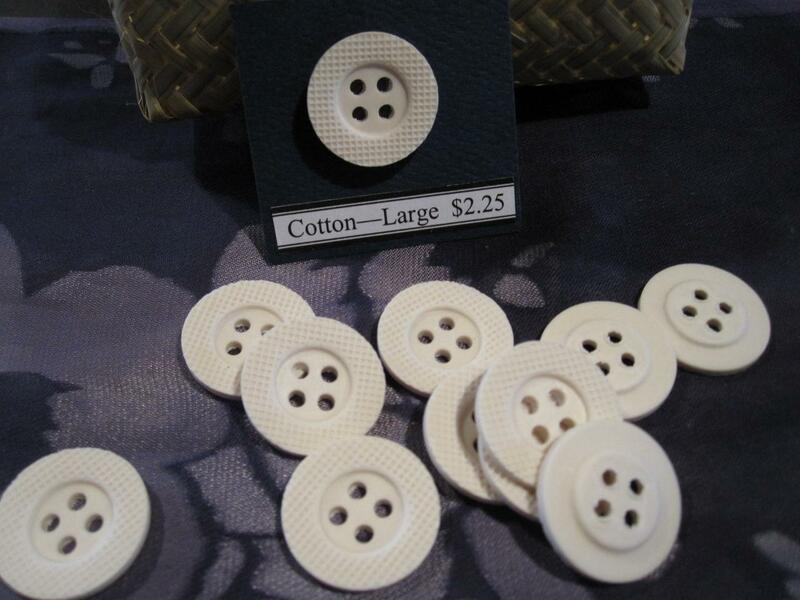 Cotton: Grown all over the world, this fiber-producing plant is usually used to make fabric or paper. 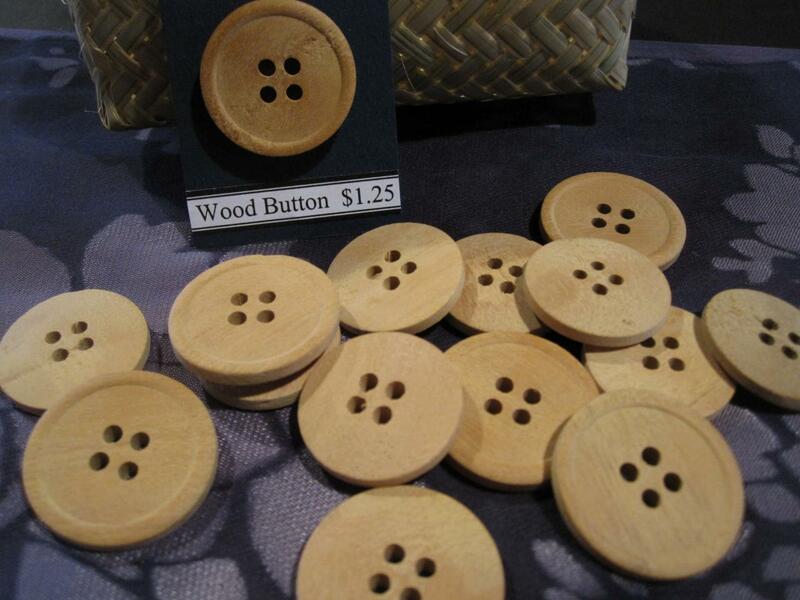 Now the plant's fiber is also being compressed into hard, light buttons. 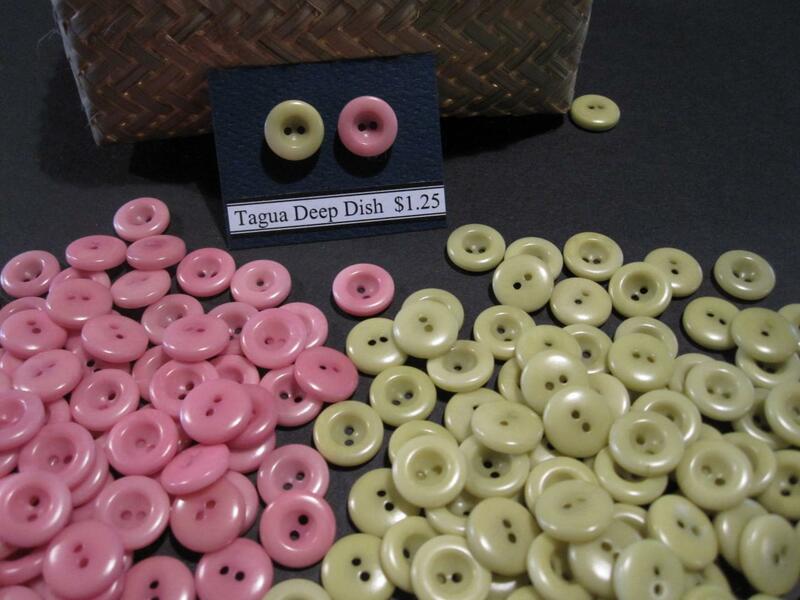 Shell: Shellfish are consumed in great quantity in many parts of the world. 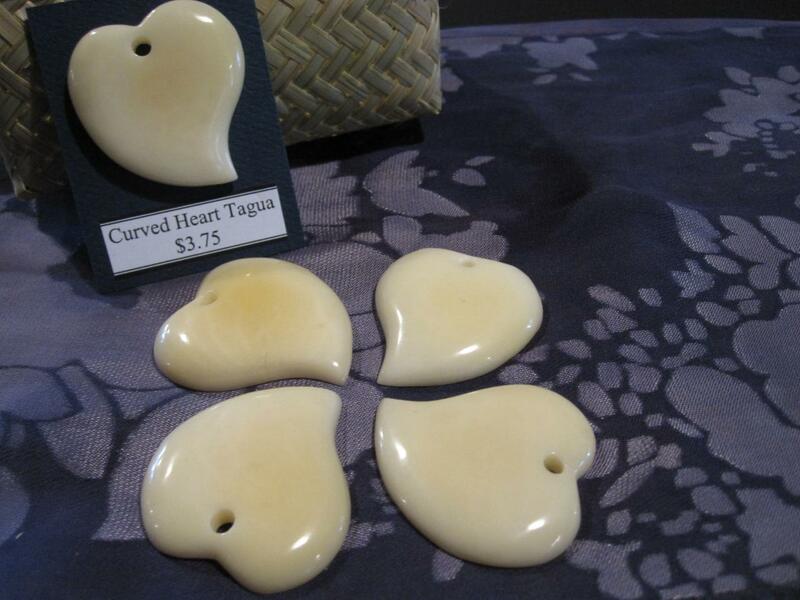 Several species have shells that are coated on the inside with layers of an aragonite compound secreted by the animal, which appears as a shining, iridescent sheen. 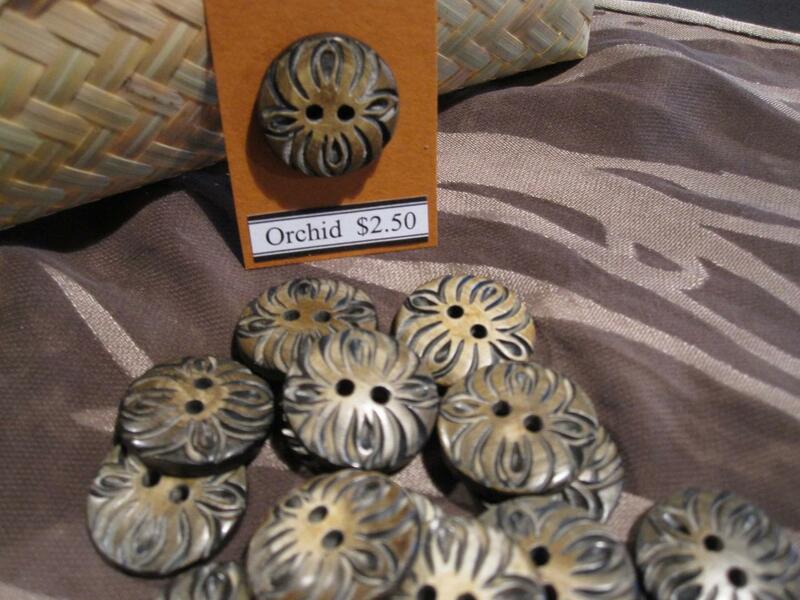 Because of the beauty of the shells, they are often made into buttons and other ornamental objects. 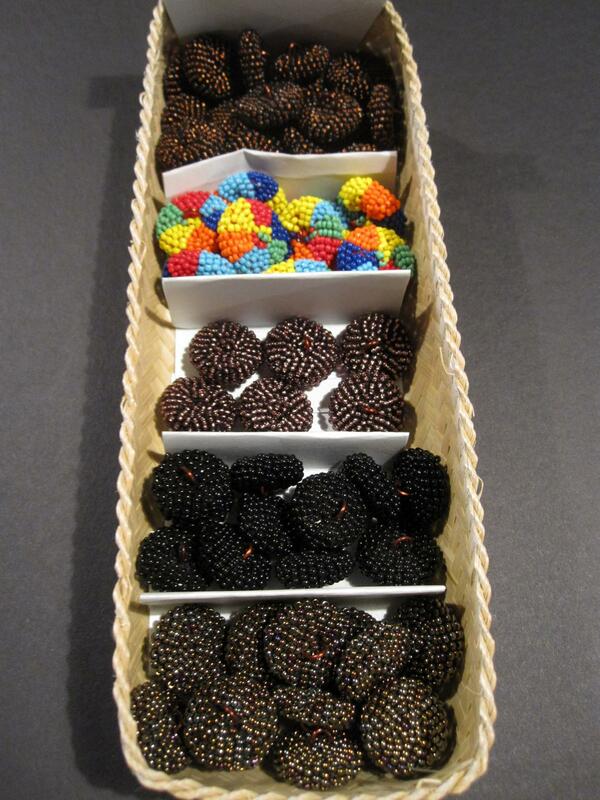 They are considered to be sustainable because they are the otherwise-wasted byproduct of the food manufacturing process. 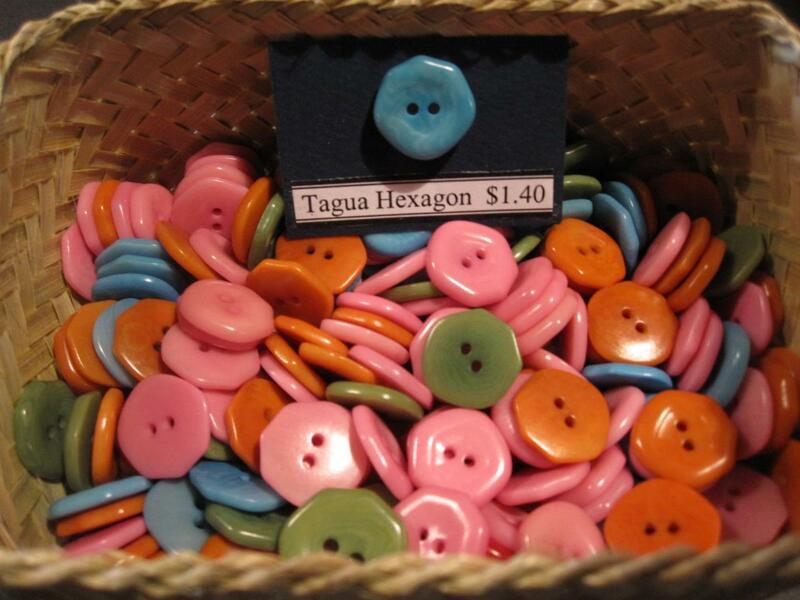 Also, check out our button assortment jars! 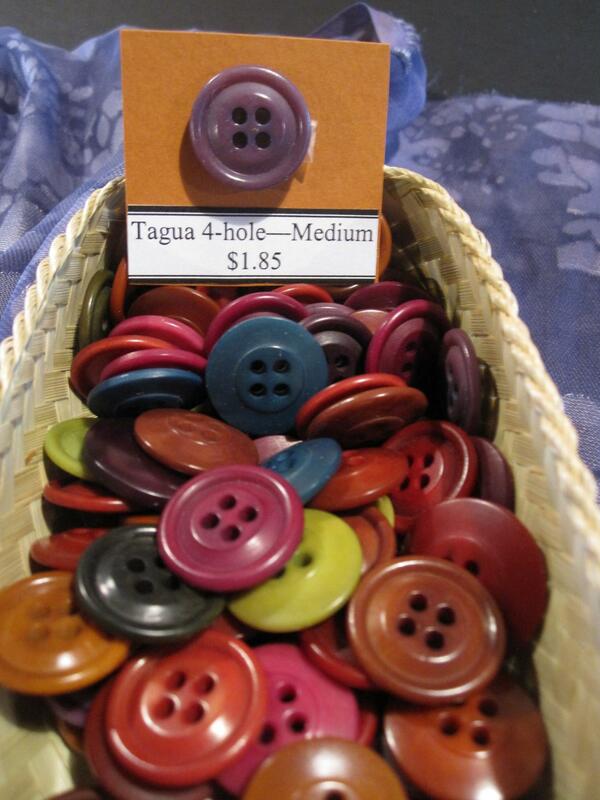 A useful metal tin with window top containing an assortment of 15 buttons---vintage, tagua, horn, shell, bone, and more! 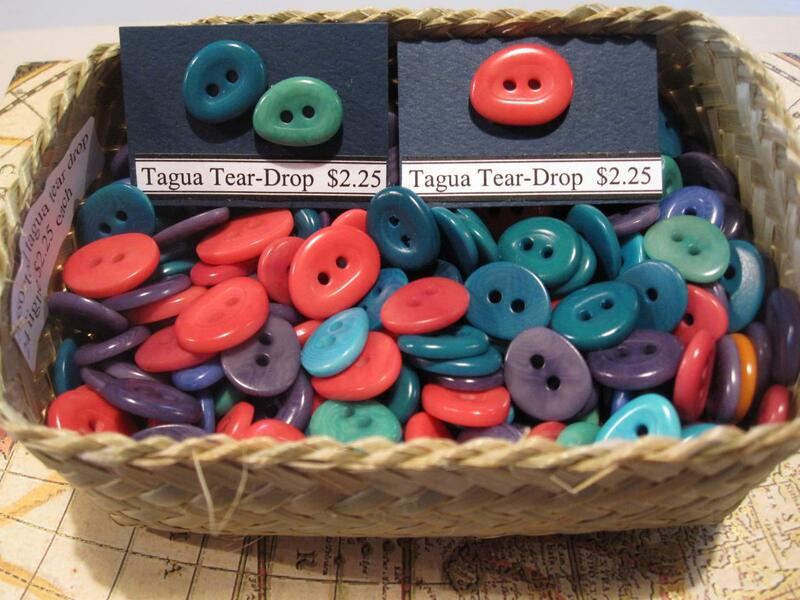 Great for gifting or crafting. 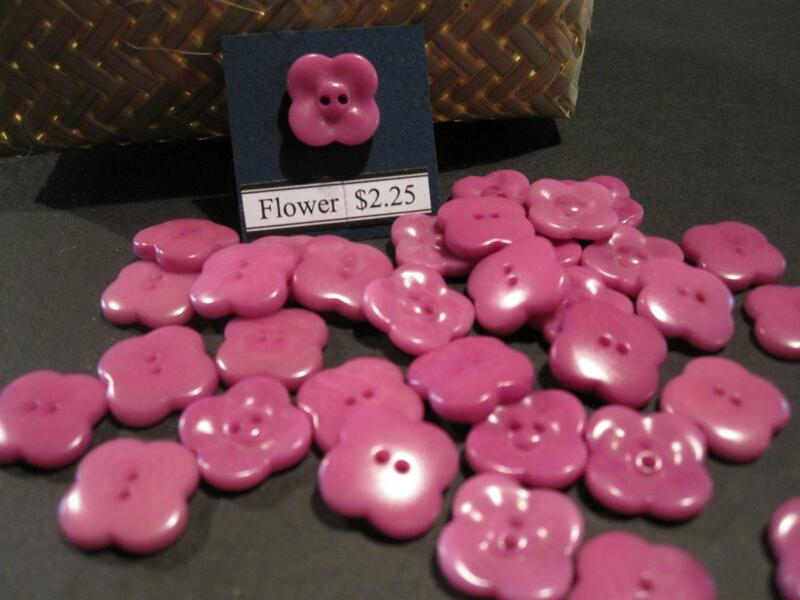 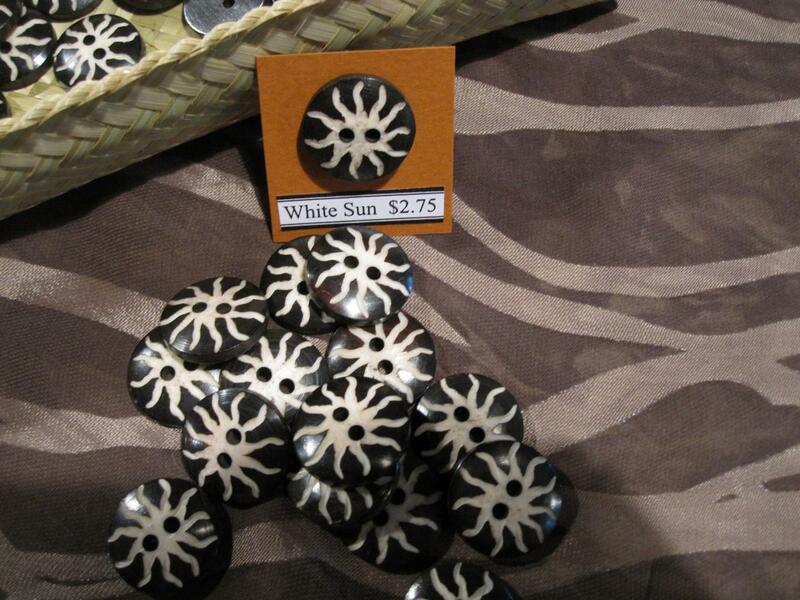 When ordering, please include the names of the buttons -- listed at the beginning of each description.